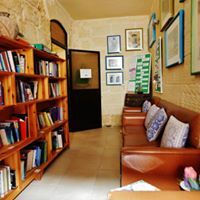 ​The Centre is open to anyone who would like to drop by and see what a tranquil and energetic place that is Lotus tal-Qalb, Gozo. You are warmly invited to sit and chat with one of our volunteers about everything the Centre has to offer, or about anything at all. Enjoy a hot or cold drink and sit and read a book, or borrow a book from our extensive library of books on the body, mind and spirit. You can have a look around the Centre; book a therapy, class or workshop. Or you can just sit and enjoy the peaceful, tranquil space without interruption. Everyone is welcome and we always look forward to meeting new friends, and friends who return time and again. All the books in our extensive library have been kindly and generously donated by friends. The library is built on trust and books are borrowed on trust. A donation for using the library is always welcome and appreciated, but not expected. 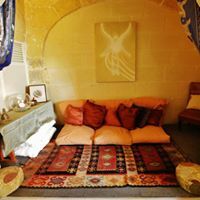 This comfortable, nurturing space can be used for quiet reflection, meditation or as a place to just sit and be. The nearby sound of trickling water soothes the brain and soul and can help to reduce stress and promote a sense of well-being. 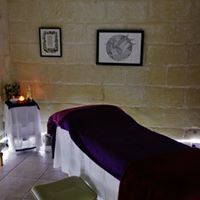 One of our two therapy rooms where you can relax and enjoy a choice of therapies from our accredited and fully insured holistic health and well-being practitioners. Visit our Available Therapies page to help you choose. Therapies are by appointment only.